While the world is not watching, Haiti is seething again. Massacres have occurred in La Saline in Haiti. Men women and children have been killed, raped, burned alive, and few are watching. But The Real News is watching. 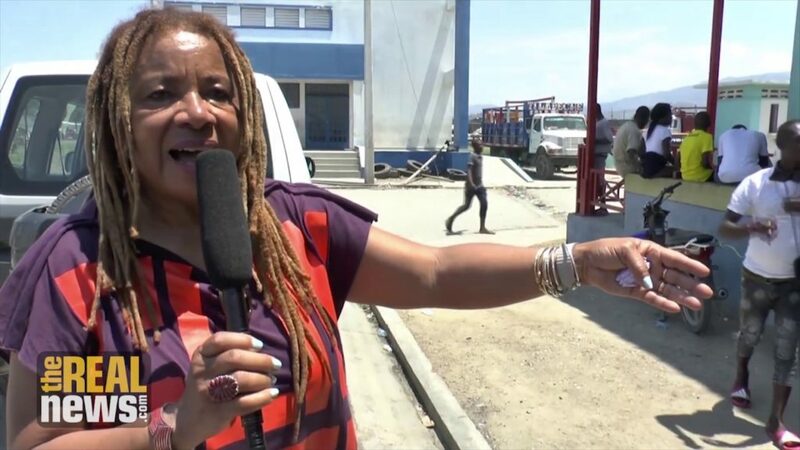 In a special report, Margaret Prescod, who hosts Sojourner Truth at KPFA in Los Angeles, went to Haiti at great risk to herself to document the violent repression that is taking place in Haiti at this moment. She’s now joining us to share what she has seen we will be seeing which she saw in a video that she brought home that they’re editing now. And let me warn everyone that some of what you are about to see and hear is quite gruesome. Margaret Prescod, welcome. Good to have you back here with us on The Real News. MARGARET PRESCOD: Thank you so much. And I’d like to say I’m very glad that The Real News is doing this and helping to get the word out. And part of why I went to Haiti was not only to get information for Pacifica Radio, for the national broadcast that I do, but also for The Real News Network. MARC STEINER: And I’m glad you did. Because this story–it’s amazing how little has been known about this story, that actually this particular episode began with some stories we heard in November about massacres taking place in La Saline. But let me play a short clip here of what you had to say about La Saline and why it’s the home of liberation. MARC STEINER: So Margaret, let’s talk a bit about that, what you were saying. Why is La Saline such a focal point, and why did these massacres occur in there November and they seem to be continuing? MARGARET PRESCOD: Well, historically, La Saline is right on the water. It’s right in the area where the slave ships came in, and the road leading up to La Saline actually is the where slaves were bought and sold. And they have had a long history of resistance that you likely heard or saw in the clip you played. However, what I didn’t know before going into La Saline, and I found out in La Saline and after I left, is that La Saline, given their history of resistance, the uprisings that we have seen somewhat covered in mainstream media last summer, but as well as earlier this year last fall, they generally begin in La Saline and then they spread across the capital Port au Prince, spread across the other parts of the country. So the targeting of La Saline, that was very, very pointed. It’s to send a political message to strike terror in the heart of people who would dare go on the streets and protest, not only against fuel prices, but asking where is the Petrocaribe dollars, the over two billion dollars stolen during the previous and present administrations, demanding that the president of Haiti, Jovenel Moise–the U.S.-backed president of Haiti, Jovenel Moise–stepped down. These are some of the demands of the movement. So the attack on La Saline was really an attempt to dampen the uprising, to dampen those protests and to strike terror in the heart of those who dare to stand up. And I should also say that this massacre, the one that happened in November of 2018, the largest since the Duvalier years–for people who may know something about Haiti’s history, you always read about the brutal Duvalier years, where you had the Tonton Macoute, these government-backed paramilitary forces, going around killing and burning people. And the last one that we know that of we could compare with what happened in La Saline was a massacre, I think it was in 1987, of peasants where 127 peasants were killed. Well, the numbers are greater now in La Saline and the massacres are continuing. MARC STEINER: Do we know how many people were killed in La Saline? Do we have a record? MARGARET PRESCOD: We really don’t. There’s been an official report done by a human rights organization. And then they did the report which was December of last year, they said there were 77 victims. However, people on the ground and other opposition officials that I have spoken–we spoke to when we were on the ground in Haiti–say those numbers are insulting, that the numbers are far greater than that. And if you also consider that the massacres have continued beyond November, you just have a sense of those numbers. MARC STEINER: So let me talk about that a bit more. One of the things you said in this video, and very clearly all the time, was that you didn’t show a lot of people’s faces because of the fear of repression and retribution if they were seen. But then a number of people that came up kind of fearlessly and put themselves on camera to talk to you. And in one of those scenes, there was a man talking about a woman whose husband was killed, another one who lost her son who was burned alive. And we’re seeing some of this now and we’re going to listen to some of this and talk about who these people were. MARC STEINER: So Margaret, talk about these people you interviewed, the ones that did put their faces on camera. That horrendous picture of the woman whose body was scarred, the other one who saw her son burning alive and killed. And they were not afraid to come forth and talk. So talk a bit about that moment and what it was like for you, and what this really means to all of us. MARGARET PRESCOD: Yeah. It was really just amazing. Because we were very, very careful, as you said, because we don’t want to put anyone at risk and we knew the danger that was involved. But as we spent a bit more time in La Saline, and as that relationship of trust happened more–I’ll also say that we were some of the first media outlets to go in there with sound and camera actually talking to the people, and they really appreciated that. And I have to say that it was the women who first came forward and said, “I’m ready to go on camera.” Could you imagine the risks that they’re taking? But just the grief and the rage was such that we were all really stunned, not only by the courage of people to come forward to say what happened to them, but what they described, what they described. A pregnant woman talking about her husband being killed, being not only killed but cut up, his body being cut up with a machete. A woman whose son was similarly killed in front of her, they forced her to watch it. And she was so traumatized by the whole thing her entire body has now broken out. A man whose son was killed. Hearing about bodies that were burned alive, of pregnant women coming forward. It was just an incredible moment of courage. But you know what, given the history of La Saline, and given the Haitian people who remain so resilient in the face of everything–this is the most impoverished place in the Americas, La Saline along the Cite Soleil, the most impoverished in Haiti. So you could just imagine the conditions that people were living under in the first place. But nevertheless, they consistently take to the streets. They consistently say, “We want to complete our revolution,” that according to the history books was won in 1804, but people still feel that they are still struggling for that democracy, that they had a glimmer of that democracy with the election of the first democratically elected president, Jean-Bertrand Aristide. And as you may know, there were two U.S.-backed coups against President Aristide. And the party that he leads, the Lavalas, they did run a candidate, Dr. Maryse Narcisse, in this last election. And it seems as though the United States, France, Canada, and the one percenters in Haiti who do their bidding, would do anything rather than have Lavalas back in power again, because the base of Lavalas are the impoverished people in Haiti. But people have not forgotten that, and they’re still holding on to the fact that they are determined, being up against everything, to continue their struggle for democracy. It’s quite remarkable and it’s quite inspiring, I have to say. MARC STEINER: So we’re here talking to Margaret Prescod from KPFK, her show, Sojourner Truth. And she went to Haiti with The Real News to tell this very special story. And we are going to pick this story up with the body of a woman who was burned alive, and also the political consequences of this, and look at some more of the visuals that we brought back, and to talk more about that with Margaret. I want to thank Margaret for doing this for all of us. And stay with us for the next segment. I’m Marc Steiner here for The Real News. Margaret Prescod is the host and producer of Sojourner Truth with Margaret Prescod. It is a public affairs program that airs Tuesday through Friday on KPFK Radio from 7 to 8 AM (PST).